Management Accounting is part of the celebrations to mark CIMA’s 90th anniversary in 2009. It looks at the development of cost and management accounting from the founding of the Institute to today. It considers a number of immediate challenges to management accountants and surveys a range of issues and challenges that will likely affect management accounting thought and practice in the future. The authors examine the possibilities for accountants to widen their focus and become more familiar with the enterprise technology determining their organisations’ cost structures and with the effects of multiple production in various locations, such as economies or diseconomies of scale. Such change may require the alteration of traditional cost models used by accountants to become more nuanced. 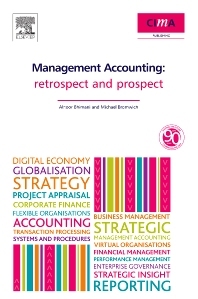 The book suggests how this may be accomplished and highlights the need for management accountants to work as part of management teams throughout the organisation as business partners rather than remain grounded in specialist information provision roles. Alnoor Bhimani is Professor of Management Accounting at the London School of Economics. He is also a Certified Management Accountant as well as an author of 15 books and over 100 articles. Michael Bromwich was CIMA’s Professor of Accounting and Financial Management at the London School of Economics and Political Science (1985 to 2006), now Emeritus. He is a Past President of CIMA (1987/88) and currently serves on CIMA’s Technical Committee.